The key difference between ALS and MND is that MND (or Motor Neuron Disease) is a serious medical condition which causes progressive weakness and eventually death due to respiratory failure or aspiration whereas ALS (or Amyotrophic Lateral Sclerosis) is a variety of MND with the characteristic feature of gradual onset of weakness on one limb, which spreads to the other limbs and trunk muscles. MND has four main varieties according to the contrasting manners of its presentation. ALS is the commonest of those four varieties. Thus, ALS is simply a different form of MND. Amyotrophic lateral sclerosis (ALS) is the commonest clinical form of MND. There is a typical paraneoplastic presentation, which usually starts from one limb, and then spreads gradually to other limbs and trunk muscles. Clinical presentation is typically focal muscle weakness and wasting, with muscle fasciculation. Cramps are also common. Furthermore, on examination, a physician can identify brisk reflexes, extensor plantar responses, and spasticity which are signs of upper motor neuron lesions. In rare cases, the patient can present with asymmetric spastic paraparesis, followed by a lower motor type weakness about a month after. Severe worsening of the symptoms over months will confirm the diagnosis. MND (motor neuron disease) is a serious medical condition which causes progressive weakness, and eventually death due to respiratory failure or aspiration. 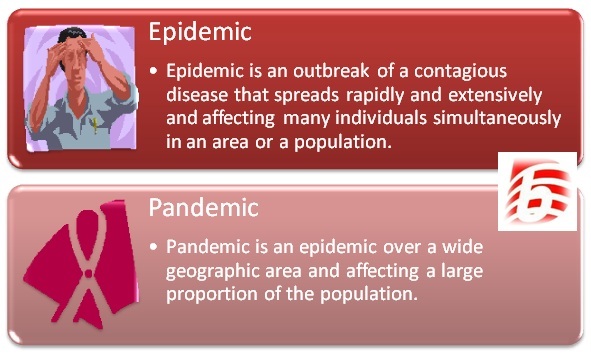 The annual incidence of the disease is 2/100000, which indicates that the disease is relatively uncommon. In some countries, physicians identify this disease as Amyotrophic Lateral Sclerosis (ALS). Individuals between 50 to 75 years of age are usually victims of this disease. However, sensory symptoms such as numbness, tingling, and pain do not occur in this disease as it does not affect the sensory system. 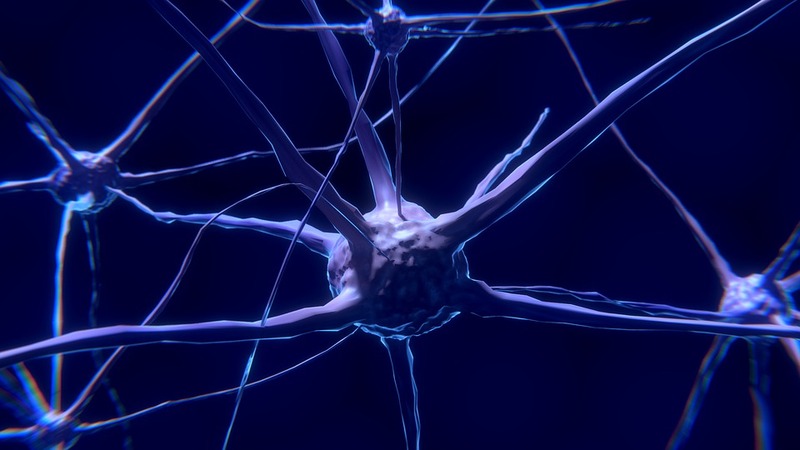 Upper and lower motor neurons in the spinal cord, cranial nerve motor nuclei and cortices are the main components of the central nervous system affected by MND. But, other neuronal systems may also get affected. For example, in 5% of the patients, Frontotemporal dementia can be seen whereas in 40% of the patients’ frontal lobe cognitive impairment is observed. The cause of MND is unknown. But it is widely believed that protein aggregation in the axons is the underlying pathogenesis that causes MND. Glutamate-mediated excitotoxicity and oxidative neuronal damage are also involved in the pathogenesis. There are four main clinical patterns, which may merge with the progression of the disease. The commonest of them is the amyotrophic lateral sclerosis (ALS). A patient suffering from progressive muscular atrophy show weakness, muscle wasting, and fasciculation. These symptoms usually begin in one limb and then spread to the adjacent spinal segments. This is a pure lower motor neuron lesion presentation. 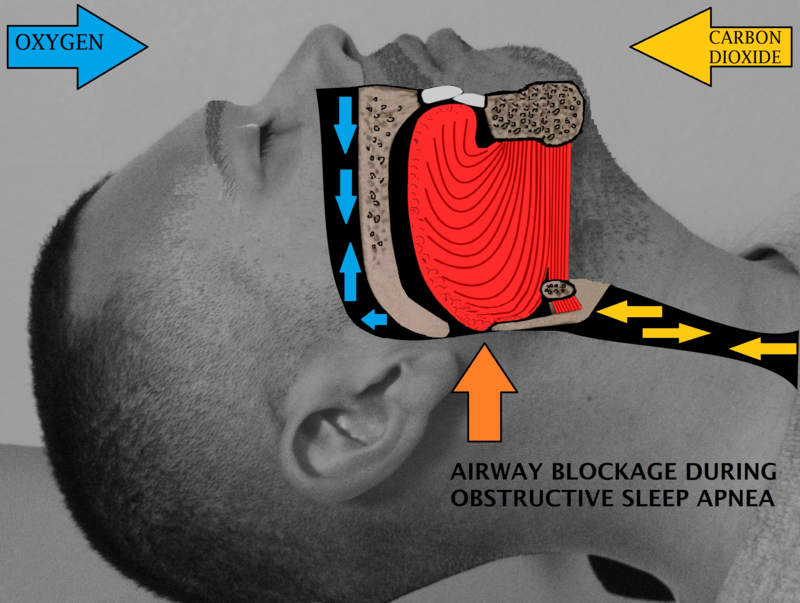 Presenting symptoms are dysarthria, dysphagia, nasal regurgitation of fluids and chocking. These occur due to the involvement of lower cranial nerve nuclei and their supranuclear connections. In a mixed bulbar palsy, one can observe fasciculation of the tongue with slow, stiff tongue movements. Moreover, in pseudobulbar palsy, emotional incontinence with pathological laughter and crying can be seen. This is a rare form of MND, which causes gradually progressive tetraparesis and pseudobulbar palsy. The diagnosis of the disease is primarily based on the clinical suspicion. Investigations can be done in order to exclude other possible causes. EMG can be done to confirm the denervation of muscles due to the degeneration of the lower motor neurons. 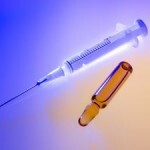 No treatment has been shown to improve the outcome. 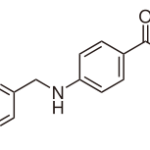 However, Riluzole can slow the progression of the disease, and it can increase the life expectancy of the patient by 3-4 months. Moreover, feeding via a gastrostomy and non-invasive ventilator support are helpful in prolonging the survival of the patient although survival for more than 3 years is unusual. What are the Similarities Between ALS and MND? Diagnosis of all the forms of MND including ALS is mainly made based on the clinical suspicion. EMG can be helpful in confirming the diagnosis because it shows the denervation of the muscles as a result of the motor neuron damage. There is no cure for any form of MND. What is the Difference Between ALS and MND? MND is a serious medical condition which causes progressive weakness and eventually death due to respiratory failure or MND has four main forms: amyotrophic lateral sclerosis, progressive muscular atrophy, progressive bulbar and pseudobulbar palsy and primary lateral sclerosis. 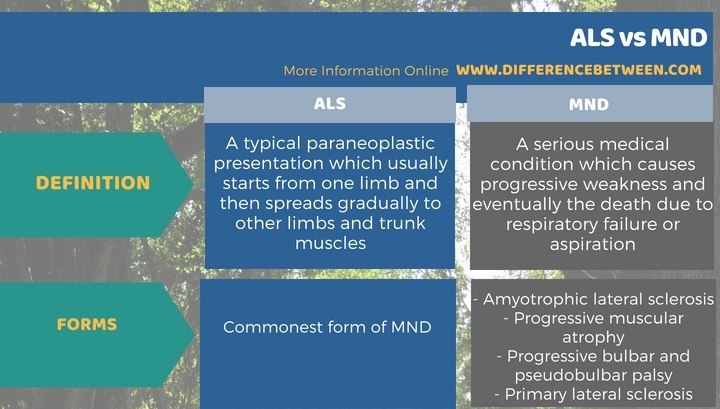 To be specific, ALS is the typical paraneoplastic presentation, which usually starts from one limb and then spreads gradually to other limbs and trunk muscles. This is the key difference between ALS and MND. Moreover, clinical features of progressive muscular atrophy include weakness, fasciculations, and muscle wasting. These features first appear on one limb and then spreads into the adjacent spinal segments. In contrast, dysarthria, dysphagia, and nasal regurgitation of fluids and chocking are the clinical features of progressive bulbar and pseudobulbar palsy. In addition, primary lateral sclerosis shows gradually progressive tetraparesis and pseudobulbar palsy. In summary, MND is a fatal disorder which gradually worsens ultimately resulting in the death when the patient loses control over his or her respiratory muscles. It can occur in four main forms, out of which ALS is the commonest. Overall, this is the difference between ALS and MND.